Leader of Your Black Muslim Bakery claims those who want to seize organization’s reins are trying to frame him for slain journalist Chauncey Bailey’s murder. Your Black Muslim Bakery leader Yusuf Bey IV denies any role in the killing of Oakland Post editor Chauncey Bailey and other violent crimes linked to the organization, claiming he has been set up by relatives and associates trying to seize the organization’s reins. In an exclusive interview Wednesday at Alameda County’s Santa Rita county jail in Dublin, where he has been held since Aug. 3, the Bey family scion said it makes no sense for him to be involved in violent crimes of any kind because he was on the verge of getting the bakery business out of bankruptcy. Court records would seem to belie Bey IV’s assurances of social civility, as he has amassed at least nine court cases in four counties in just 2 1/2 years. Bey IV said he had nothing to do with Bailey’s slaying, in which bakery handyman Devaughndre Broussard has been arrested and charged. Police have publicly said they believe Bey IV was involved as well, apparently because of stories Bailey had written or was planning to write about the bakery. Bey said he had no beef with Bailey and in fact had thrown Broussard out of the organization a few months before Bailey was killed, but later let him return on the recommendation of a trusted associate. “There were too many important things going on. I would never bring the heat on, especially at a time like this,” Bey IV said, using a phone handset to speak to reporters through a glass partition in a jail visiting room. “I’m 21 years old; I’ve got two kids; I’m not going to be wasting my time doing that.” Dressed in a red jumpsuit, a towel around his neck, Bey IV’s eyes sometimes flashed with anger in response to certain questions. But he was never less than polite and sometimes his voice dropped so low he was hard to hear. “I’ve never met Chauncey Bailey, and I don’t remember ever making a quote (saying) he had slandered my father,” he added. “As a matter of fact, I was more upset with Chris Thompson’s articles in the East Bay Express than anything, because he was slandering my father while he was dying of cancer.” Thompson in 2002 wrote a series of articles in the weekly newspaper that explored the bakery’s violent history in the city. Bey IV said he had nothing to do with the unsolved 2004 death of Waajid Aljawwaad, the hand-picked successor to bakery founder Yusuf Bey — Bey IV’s father, who died of cancer in late 2003. Aljawwaad disappeared in February 2004 and was found months later in a shallow grave in the Oakland hills. Nor did he have anything to do, Bey IV said, with the attempted assassination in June 2005 of John Bey — manager of the organization’s security business — who was shot several times outside his Montclair home by three men. Police have said they believe Aljawwaad’s death and John Bey’s attempted death were parts of a power struggle for control of the bakery. Bey IV said he had nothing to do with the July slayings of Odell Roberson Jr. and Michael Wills Jr., shot four days apart but both within a few blocks of the bakery headquarters, and both with an assault rifle matching the one police said was used in December to shoot up a car belonging to a man they said was Bey IV’s romantic rival for a woman. 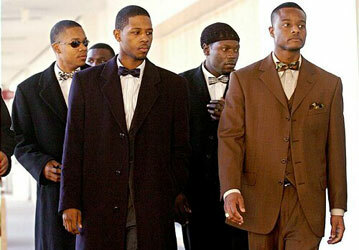 Roberson reportedly was the uncle of a man about to be tried for the 2005 slaying of Bey IV’s elder brother, Antar Bey. Antar took over as CEO after Aljawwaad’s disappearance and would be succeeded by Bey IV. Again, he said he had nothing to do with the shooting of the car, claiming the woman in question was simply a bakery employee who may have had a case of “fatal attraction” concerning him. And although police reports say he acknowledged a role, Bey IV said Wednesday he had nothing to do with the May 17 kidnapping and torture of two women, the crime which yielded the charges on which he’s currently held without bail and — if convicted — could face life in prison without the possibility of parole. Four other bakery members — Yusuf Bey V, Joshua Bey, Tamon Halfin and Richard Lewis — also have been charged in the case. Even though police say they have sound and video recordings of him admitting his involvement in the kidnap and torture, he claimed Wednesday, “I never admitted to any kidnapping. I never kidnapped or tortured any women and I never would. I respect women too much. “I would never be part of any violence unless acting in self-defense,” he said, seeming particularly upset about being asked about Aljawwaad’s killing and the John Bey attack. Bey IV said Wednesday he believes Ali Saleem Bey, his half-sister’s husband, has been pulling strings and perhaps even arranged Bailey’s killing in order to set Bey IV up for a fall so older members of the bakery organization could seize power. Ali Saleem Bey has acknowledged he was the source providing Bailey with information about the bakery, as a means of undermining Bey IV’s control. Ali Saleem Bey has claimed Antar Bey illegally seized control of the business after Aljawwaad vanished, and has tried to enlist local officials’ aid in regaining the bakery’s reins. On Thursday, Ali Saleem Bey called Bey IV’s claims absurd: “He has a history of lying to manipulate, especially in regards to the family. “‘Everybody’s innocent in jail,’ is the famous saying,” Ali Saleem Bey added dryly. During the jail house interview, Bey IV even said he believed Ali Saleem Bey might’ve had an indirect hand in Antar Bey’s death. He said he believes the man about to go on trial for Antar’s slaying — Alfonza Phillips, reportedly recent slaying victim Roberson’s nephew — was indeed the trigger man, as police and prosecutors say. Bey IV claimed the timing of Bailey’s slaying implies an effort to derail his control of the bakery; he noted a bankruptcy hearing had been set for Aug. 9, a week after Bailey’s slaying. “At bankruptcy court, everything was going in my favor. Business advisers were helping me meet all the regulations set by the judge. I was prepared to go in and make it successful. “I had nothing to gain and everything to lose. Anybody with clear eyes would see I had everything going for me in the organization,” Bey IV said, adding he was arrested “six days before (going) to bankruptcy court. What judge would grant me this with all these things going on? “I definitely believe I was set up by someone in my organization and outside,” he said. But Bey IV was taken into custody during the Aug. 3 raid and later arrested and charged not in connection with Bailey’s slaying, but rather in connection with the May 17 kidnapping and torture incident. The raid’s search warrants were issued July 30, three days before Bailey was gunned down. And bankruptcy court records show things definitely were not going in his favor. The bakery had failed to file reports, pay fees or refinance or sell its property, and a judge in July had ordered that the voluntary Chapter 11 reorganization bankruptcy protection the bakery had sought in October 2006 be converted into involuntary Chapter 7 liquidation. The conversion was to be effective Aug. 9, but the judge agreed to hear the bakery’s motion for reconsideration on that date. Though Bey IV denied Wednesday having anything to do with Bailey’s killing, he acknowledged police reports’ account that Broussard had asked to speak to him while both were in police custody on Aug. 3. Broussard confessed to Bailey’s slaying soon afterward, although he since has recanted that confession. Broussard’s lawyer, LeRue Grim, has said Bey IV told his client if he took the rap for the Bailey killing he would be taken care of. Bey IV said he never told Broussard that, but did tell him, “‘If you thought you were doing something right, take the responsibility,'” adding Broussard had never said anything to him about being seen as a “good soldier” or gaining stature in the bakery organization for killing Bailey. Bey IV also said Broussard’s claim the two of them drove by Bailey’s home the night before the slaying is false; it never happened, he said. Bey IV claimed Ali Saleem Bey met with Bailey at the Oakland Post’s office the night before Bailey died. But Ali Saleem Bey said he met with Bailey only twice in mid-July, and spoke to him by phone once later when Bailey told him Post publisher Paul Cobb had declined to publish the story until it was better attributed and corroborated. “After that I never did speak to Chauncey or meet with Chauncey again,” Ali Saleem Bey said. Bey IV said he believes Ali Saleem Bey wants the bakery in order to get city grants and loans otherwise unavailable to him. “I said my father had never relied on the city for a penny and I’m not going to start. I guess I was just ticking him off,” Bey IV said. Actually, the family had borrowed plenty of public money. Your Black Muslim Bakery received a $30,000 loan from the city in late 1997; the loan was delinquent for more than two years before it was finally repaid in December 2000. The city also awarded $1.5 million in loans to launch EM Health Services, a home health care training company formed under the umbrella of Qiyamah Corp., a nonprofit organization formed by bakery founder Yusuf Bey to expand his organization’s efforts to provide community job training, education, housing and substance abuse counseling. Those loans, a combination of city and federal loan funds, never were repaid. Bey IV said if he has learned anything from what has happened over the last several months, it is he should not be trusting of people.